Pranayama: Practice five minutes of Breath of Fire pranayama. Japa: Practice ten minutes of japa using the mantra Om Dum Maha Durgayai Namaha or the mantra for Kali, a manifestation of Durga, Om Klim Kalikayai Namaha. Silent Meditation: Sit in silence for fifteen minutes to immerse yourself in the vibration of Maha Kali. Listen to the 21 minute guided meditation recorded by Sai Maa’s Brahmacharini, Shree Devi, for the first phase of Navaratri. When you worship Kali Mata, she grants enlightenment. 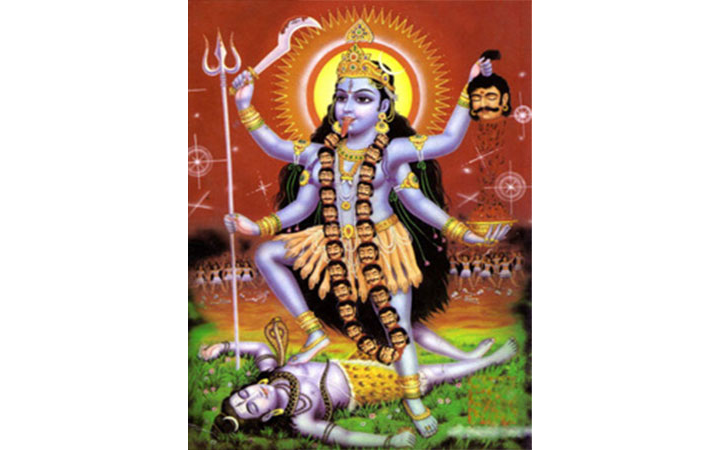 Kali Mata and Shiva both are strong about enlightenment, cleansing karma, activating Kundalini. Worship one or both if you wish to be enlightened. Shiva will clean your karma, Kali Mata will take care of your mind. Each skull (around her neck) represents a thought, and she eats it, garlands herself with it. When she cuts the head that’s what it means, killing these limited thoughts, mind. She dances on that aspect of the human that is the ego, the personality. The heart of Kali Mata is nectar, sweetness, tenderness, softness. She is so devoted to her disciple, serving with firmness; how we become centered in body, in heart, in mind, which are shifting. Chant to Kali, healing happens fast when you open your chest, body. Openness – key to openness is within us. When energy comes up and you don’t want to deal with it, dare, dare, dare. Reflect on the following questions for the next three days, using a journal to record your thoughts. Am I aware of my thoughts, feelings, and energy? Are they based in love or fear, Self or ego/personality? Am I daring to be honest with myself, and vigilant in taking action within myself to transform what’s not serving me? Am I focused and disciplined in uncovering my patterns, and in shifting my thoughts, feelings, and energy? As I transform, do I accept who I am, have compassion for myself, or do I judge and feel unworthy?